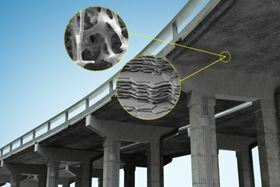 By investigating connections between the structure and mechanical properties of biomaterials such as bones and shells, researchers at MIT hope to improve the performance and longevity of concrete. Image: Christine Daniloff/MIT. Researchers at Massachusetts Institute of Technology (MIT) are taking inspiration from nature in their efforts to redesign concrete – the most widely used human-made material in the world. In a paper published in Construction and Building Materials, the researchers contrast cement – concrete's binding ingredient – with the structure and properties of natural materials such as bones, shells and deep-sea sponges. As the researchers observed, these biological materials are exceptionally strong and durable, thanks in part to their precise assembly of structures at multiple length scales, from the molecular to the macro level. From these observations, the researchers, led by Oral Buyukozturk, a professor in MIT's Department of Civil and Environmental Engineering (CEE), proposed a new bioinspired, ‘bottom-up’ approach for designing cement. "These materials are assembled in a fascinating fashion, with simple constituents arranging in complex geometric configurations that are beautiful to observe," Buyukozturk says. "We want to see what kinds of micromechanisms exist within them that provide such superior properties, and how we can adopt a similar building-block-based approach for concrete." Ultimately, the team hopes to identify materials in nature that may be used as sustainable and longer-lasting alternatives to Portland cement, which requires a huge amount of energy to manufacture. "If we can replace cement, partially or totally, with some other materials that may be readily and amply available in nature, we can meet our objectives for sustainability," Buyukozturk says. Co-authors on the paper include lead author and graduate student Steven Palkovic, graduate student Dieter Brommer, research scientist Kunal Kupwade-Patil, CEE assistant professor Admir Masic, and CEE department head and professor of engineering Markus Buehler. "The merger of theory, computation, new synthesis and characterization methods have enabled a paradigm shift that will likely change the way we produce this ubiquitous material, forever," Buehler says. "It could lead to more durable roads, bridges, structures, reduce the carbon and energy footprint, and even enable us to sequester carbon dioxide as the material is made. Implementing nanotechnology in concrete is one powerful example [of how] to scale up the power of nanoscience to solve grand engineering challenges." Today's concrete is a random assemblage of crushed rocks and stones, bound together by cement. Concrete's strength and durability depends partly on its internal structure and configuration of pores. For example, the more porous the concrete, the more vulnerable it is to cracking. However, there are no techniques available to precisely control concrete's internal structure and overall properties. "It's mostly guesswork," Buyukozturk says. "We want to change the culture and start controlling the material at the mesoscale." As Buyukozturk describes it, the ‘mesoscale’ represents the connection between microscale structures and macroscale properties. For instance, how does cement's microscopic arrangement affect the overall strength and durability of a tall building or a long bridge? Understanding this connection would help engineers to identify features at various length scales that could improve concrete's overall performance. "We're dealing with molecules on the one hand, and building a structure that's on the order of kilometers in length on the other," Buyukozturk says. "How do we connect the information we develop at the very small scale, to the information at the large scale? This is the riddle." To start to understand this connection, Buyukozturk and his colleagues looked to biological materials such as bone, deep sea sponges and nacre (an inner shell layer of mollusks), which have all been studied extensively for their mechanical and microscopic properties. They looked through the scientific literature for information on each biomaterial, and compared their structures and behavior at the nano-, micro- and macroscales with that of cement. They looked for connections between each biomaterial's structure and its mechanical properties. For instance, the researchers found that a deep sea sponge's onion-like structure of silica layers provides a mechanism for preventing cracks. Nacre has a ‘brick-and-mortar’ arrangement of minerals that generates a strong bond between the mineral layers, making the material extremely tough. "In this context, there is a wide range of multiscale characterization and computational modeling techniques that are well established for studying the complexities of biological and biomimetic materials, which can be easily translated into the cement community," says Masic. Applying the information they learned from investigating biological materials, as well as knowledge they gathered on existing cement design tools, the team developed a general, bioinspired framework, or methodology, for engineers to design cement, ‘from the bottom up’. This framework is essentially a set of guidelines that engineers can follow to determine how certain additives or ingredients of interest will impact cement's overall strength and durability. For instance, in a related line of research, Buyukozturk is looking into volcanic ash as a cement additive or substitute. To see whether volcanic ash would improve the properties of cement, engineers would follow the group's framework, using existing experimental techniques such as nuclear magnetic resonance, scanning electron microscopy and X-ray diffraction to characterize volcanic ash's solid and pore configurations over time. The engineers could then plug these measurements into models that simulate concrete's long-term evolution, in order to identify mesoscale relationships between, say, the properties of volcanic ash and its contribution to the strength and durability of an ash-containing concrete bridge. These simulations can then be validated with conventional compression and nanoindentation experiments, to test actual samples of volcanic ash-based concrete. Ultimately, the researchers hope the framework will help engineers to identify ingredients that are structured and evolve in a similar way to biomaterials, improving concrete's performance and longevity. "Hopefully this will lead us to some sort of recipe for more sustainable concrete," Buyukozturk says. "Typically, buildings and bridges are given a certain design life. Can we extend that design life maybe twice or three times? That's what we aim for. Our framework puts it all on paper, in a very concrete way, for engineers to use."